Elchim 3900 Healthy Ionic Dryer is easily one of the best professional blow dryers that you can purchase for home use. It offers a lifetime warranty which is almost unheard of in todays market for any products. It operates with ceramic and ionic technology to give you that quick dry with outstanding results. The design and weight of the dryer allows you to use it for hours with little to no fatigue, truly a professional dryer. 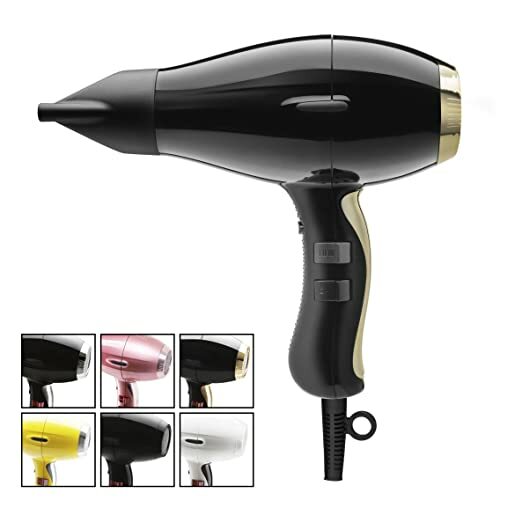 Elchim 3900 Hair Dryer Best Suitable For What Hair Type? Although it is best suited for thick, curly hair, anyone can use this dryer. You will have 2 speed setting and 3 temperature settings to customize your drying routine. The low setting provides enough power to dry thin and fine hair and will not cause damage. You may want to purchase a cheaper dryer if you are just going to use low settings as this is a dryer meant for speed and heat that professionals require. It can also be used with color treated hair but take precautions and use a stay-in heat protectant. The ionic and ceramic system is famous for hydrating hair and leaving it with a healthy sheen and without the nasty fizzes thanks to the elimination of static electricity. If you have thick curly and long hair you need a dryer with high wattage to give you the opportunity for a quick dry. The Elchim 3900 has 2000 watts of power and would be a perfect fit for you. It is said that this dryer will cut your drying time by 30% and who can’t use a little extra time in the morning when getting ready for work. If you have short hair or hair that is fine and thin, the dryer might be an over kill for you. The Ionic and Ceramic heating material will hydrate your hair during the drying process leaving you with a shiny professional look. The negative ions that are produced will help close the cuticle on the hair shaft quickly and prevent a case of the frizzies from happening. This is a definite plus for the ladies with natural curly hair that requires special treatment. The cool Shot button is located on the handle and is easily accessed by either the thumb or the index finger. Most professionals want a dryer that has this feature as it helps them set a curl in the hair with their brush. Years ago, the curl set was always done with rollers and it took up a lot of time. Now it is possible to set a curl with the cool shot in seconds and move on with the styling process. To activate the cool shot button just press it on, do your spot drying press it off. Other blow dryers have a press and hold button and it is preferred by many stylists as it prevents them from forgetting about the cool shot button being on. The Elchim 3900 Ionic Hair Dryer comes with two different sized concentrator heads that are easy to put on and take off for spot on styling. If you would also like a diffuser, it can be ordered separately. Having the two sizes of concentrators allow the stylist to do more precise styling by keep the air flow in a certain spot without disturbing the entire head of hair. Let’s say that you have just set three curls with the cool shot feature. Now you need to do a few more on the rest of the head without messing up what’s already been done. Use the smaller concentrator attachment and zone in on that certain part of the head without affecting your finished curls. The two settings may not seem like enough versatility but keep in mind this is a professional blow dryer and, in their hands, it has adequate settings. With some practice, you will find that it is enough for you also. When you consider that the airflow travels at around 19.5 to 24 mph as it comes out of the dryer, you can see that the speed is more than enough to dry any type of hair with 30% less time. The heat produced will also be adequate for any type of hair as if flows over the ionic and ceramic elements. This is truly a lightweight dryer with amazing power. You could use it all day and still not be bothered with an ache in the wrist, arm or elbow. This lightweight dryer allows you to move your drying arm around more getting at those hard to reach places. You can move around the head and up and down with ease. If you have younger users in the family, this will work well for them as they learn the art of drying hair. Having a power cord at 9 feet in length is a plus. It will give you the mobility needed to do your drying session without having to change your position constantly as is necessary with a short cord. The dimensions are 7.3 x 7.9 x 3.5 and I would consider it between small and medium but very powerful. Considering the power and versatility of this blow dryer, the cost is right in line with the competition. Keep in mind that the Elchim 3900 has a lifetime warranty and I can’t think of any other hair dryer on the market that offers this to their customers. The Company has great customer service and will get to the bottom of any problem you have with their product. For a professional dryer the price fits the product. What are the Customers Saying About This Dryer? When looking at the reviews by customers you will be hard pressed to find much of anything negative about this blow dryer. They are impressed with the balance, heat and speed setting, the cool shot, the overall comfort the dryer offers while in use, the lifetime warranty and especially the end results, a smooth, silky finish to the hair. Customers would like to see the company add a diffuser to the package but since you can purchase one separately, they are okay with that. After researching and reviewing the Elchim 3900 the conclusion is very much in favor of this hair dryer. The ionic and ceramic technology makes this dryer a healthy choice for your hair. No more static cling and frizzies, just smooth and sleek results. This product offers a great warranty for your investment. If the Elchim 3900 hair dryer isn't suitable for you check out my other reviews on other professional hair dryers here hopefully you will be able to find one that suits the needs of your hair type.